Our top choice for a flexible design with a multitude of uses. Ventilated Shelving allows air to circulate on all sides of stored items — especially underneath — preventing mold, mildew and musty odors. Comes in a variety of depths to suit nearly every space. Can be custom cut to any length. Supports a moderate amount of weight. A top choice for use in warehouses and industrial settings, heavy-duty pallet shelving offers greater muscle than our free-standing shelving. 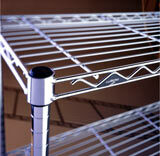 Weight capacity of up to 2,400 pounds per shelf. Suitable for heavy items such as snow tires and bags of topsoil. Can be configured to your space, with over 250 options for height, width and depth. Powder-coated steel construction is rustproof, reasonably priced and available in a variety of colors. 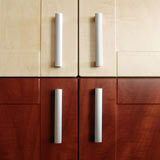 Sleek interlocking panels offer extraordinary flexibility in configuring heavy duty storage solutions. 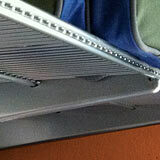 Hooks, shelves and cabinets can be mounted where needed, no studs required. Ideal for hanging heavy items securely. Heavy-duty PVC (polyvinyl chloride) construction is built to last and to endure dramatic changes in temperature and humidity. These storage units, featuring ventilated shelving, can handle heavier loads than wall-mounted systems. Excellent for storing bulky and oversize items in garages and basements. Can be customized either with adjustable leveling feet or casters. Durable, corrosion-resistant steel construction performs well and looks good year after year. What does your garage look like right now? Can you find things easily? Are you making good use of your storage space? 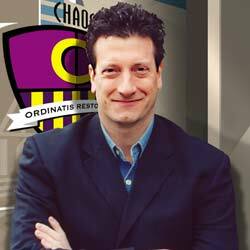 If the answer is no, the organizational experts at Chaos Commandos can help! Perhaps, the most important aspect of having your garage professionally organized is determining what you want to keep, and how much storage space is needed to keep your things neat and organized. What size garage do you have? Whether you need help with garage storage shelving in your home, your business or even your warehouse, we have the solutions for you. We have an amazing array of shelving that we can install in your space so you can have someplace to put all of your stuff. This can be everything from your day to day “stuff” or the inventory for your business. One thing is for sure – with it organized, you will be able to find everything you need quickly. A lightweight, strong, corrosion-resistant option, about one third as dense as steel. Impressive durability — ideal for cabinetry in garages and basements. Resists moisture from rain, melting snow or high humidity. 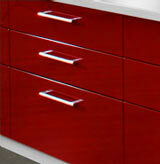 Cabinets can feature laminated panels or powder coating to add a splash of color to your newly organized garage. All the steel cabinetry we recommend has been galvanized — an iron or zinc coating process that prevents rusting and corrosion. A final powder coating bonds paint to the surface for a complete seal. High quality finish is impervious to the chemicals often found in garages and workshops. Resists chipping, denting and peeling. Withstands extreme heat or cold. The manufactured wood products we recommend and install — including cabinets and shelving — are high-grade MDF, not to be confused with the lower quality and less durable particle board. Denser than plywood, more uniform than natural wood. Available in a wide variety of colors, from neutrals to brights. 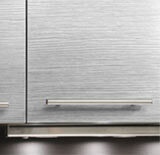 Bright, sleek, modern-looking low-carbon steel for beautiful cabinetry that's built to last. Contains chromium at 10 percent or more by weight, giving it unique stainless and corrosion-resistant properties. High strength-to-weight ratio delivers excellent value over time, more than compensating for a higher initial cost than other metals. Beech wood or maple stay smooth even when they're subjected to repeated friction. Stainless steel is non-porous, watertight, chemical- and stain-resistant. A tough, durable material that shows you take whatever you do in your garage seriously. Raised geometric pattern creates positive traction, minimizing the risk of slipping on driving and walking surfaces. Classic no-nonsense appearance looks rugged and sturdy on vertical surfaces such as metal cabinets. What does your flooring look like right now? Does it have a lot of grease stains? Is it unsightly due to other stains and spills? Your garage will look a lot cleaner and more organized if you can clean the floor of your garage easily – like being able to simply hose it down. Impossible you say? Trust Chaos Commandos to show you the light at the end of the tunnel. We have worked with a lot of different types of garage flooring. This gives us the ability to show you all sorts of different applications that can work in your space. From interlocking floor tiles to epoxy coating and even diamond plate, we are able to get you any kind of flooring you want. We can work within the confines of any budget and discuss the pros and cons of every type of flooring so you get the very best kind for your garage. When you have a new garage floor, it will give you a newfound respect for your space. It will look more presentable and provide you with the pride you need to keep the space looking its very best. A good option when a more permanent floor treatment isn't necessary. Interlocking tiles snap together like jigsaw puzzle pieces. Made of high-density plastics that stand up to repeated tire and foot traffic. Resistant to oil, grease, antifreeze and other chemicals. Easy to clean — just hose them off. A recommended protective top layer for epoxy or concrete flooring. 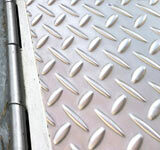 Industrial-grade mats designed to safeguard garage floors year round — year after year. Protection against stains and corrosion caused by anti-freeze, motor oil, road salt, battery acid and more. Available in a variety of colors, textures and sizes. An all-purpose garage flooring option that needs to be professionally installed. Functions as a topcoat, sealer and crack filler that can be installed over any existing floor. Extends the life of your concrete. Our installation specialists conduct extensive testing of your garage floor before they apply the epoxy, using only commercial- and industrial-grade products for high quality results. Available in many color combinations. Garage shelving doesn’t have to be open. We can provide you with cabinets, allowing you to hide some of your household items behind a closed door. 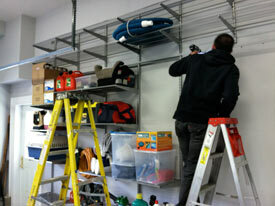 We can show you how to transform your garage into something much more colorful, exciting and most importantly, organized. We have a variety of cabinets and countertops to provide you with workspace to get more use out of your garage. Aluminum steel, stainless steel and fiberboard cabinets await you at Chaos Commandos. With a vast selection to choose from, you get the style you want at the price you can afford. Once you have the better tools, organization will be much easier. You may not have the right setup in your garage right now, but that doesn’t mean it has to stay that way. Think about what you want to do in your garage and we will show you how it’s possible. 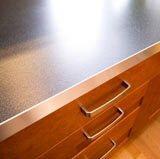 Take a look at some of the cabinets and countertops we offer and what they can do for your space. Having a clean and organized garage is important – and that means having the right tools within the garage to accomplish it. Take a look around your garage as it is right now. Are you happy with the way things look? Whether you don’t like the flooring, want more shelves or you want workspace with countertops, it’s all possible. At Chaos Commandos, we will work within your budget and within your space to provide you with something customized that you can be proud of. You can use your garage as storage, recreation and still have room to store your car inside. If you don’t think it’s possible, think again. Our expert organizers are prepared to work with you every step of the way to clean up your clutter and give you better looking space. 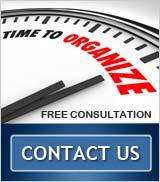 Contact us today to schedule your free consultation. 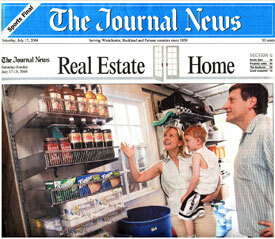 We will get you organized so you can finally have a garage that you will be proud of. 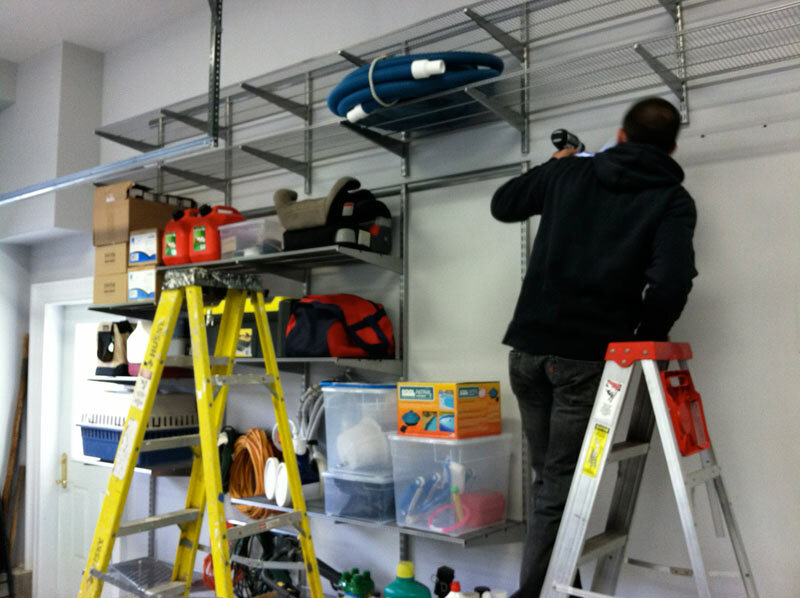 We will help you determine what garage storage shelving will work better for you for your personal goals. 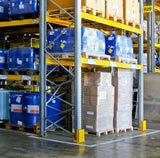 We will talk to you about ventilated shelving, pallet shelving and much more. We'll handle all facets of the installation and will help you determine whatever other organizing needs you may have for your space. Chaos Commandos is capable of sizes small and large. No matter how chaotic you think your space is, we have seen worse and provided solutions for it. Garage storage shelving and garage flooring can be added to transform your space into something not only visually stunning but more versatile, too. You may or may not park your car in your garage. Whether you do or not, the space around you can be changed around to better suit your needs. There’s no reason to be stuck with the same garage that you moved into your home with. Now it’s your turn to take it to the next level. You don’t have to be happy with basic shelves and some storage tubs. That’s not really going to solve your storage problems – especially when you utilize things stored in your garage on a regular basis. Our professional organizers will be able to work with you and provide you with customized solutions that will get your garage organized once and for all. We have an array of options for you within your garage, allowing you to add color and purpose to your walls and your floor. Garage flooring can be provided to you in many colors and provide traction for the tires of your car as well as your shoes so you don’t have to worry about slipping and sliding or skid marks. We also have an array of garage shelving that we can talk to you about, complete with cabinets and countertops so you can enjoy more workspace.